The Most Gruesome Injury in Sports - The Compound Fracture! In today’s blog we will chat about low bone density! What is Bone Density and How Does it Relate? Bone density describes how thick your bones are at a certain time period. As we age our bone density tends to decrease. Young athletes should have a normal bone density that supports their bodies with minimal risk for fracture. Overtraining or training past our bodies tolerance levels, can reduce your bone density and lead to fractures (breaks in your bones). It is important to make sure that we are training our bodies not only to improve the performance of our muscles, and ligaments, but also our bones. Bone density scans are used to help determine how thick our bones are. There are normal levels that are expected for athletes and individuals of a certain age. 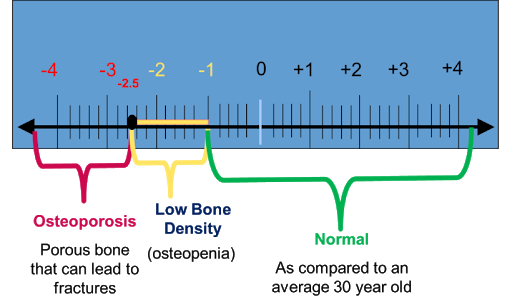 Below is a chart describing bone density levels and showing the normal ranges. When we hear the terms osteoporosis and osteopenia, we should be thinking bone density. Osteoporosis is clinical diagnosed when your bone density falls in the -2.5 to -4 range (think very brittle bones). Osteopenia or low bone density occurs at levels -1 to -2.5 (think moderately brittle bones). I have some good news out there for those trying to prevent these injuries from happening to them. Bones respond to stress! I repeat bones respond to stress! It may sound unfamiliar and counterintuitive but let me explain. It is important that we stress our bones to make sure that they are strong enough for sporting activities. Exercises like squats, deadlifts, and lunges, are great options to help improve bone density. The key is we have to load these exercises. This is where the stress comes into play. Without enough intensity, our system won’t respond in a positive way. When the appropriate intensity is added however our bones respond by getting thicker! Check out this video of exercises that are great options to help improve your bone density! Improving your bone density can help reduce your risk for stress fractures, and stress reactions (minor bone changes that lead to fractures). Undiagnosed stress fractures that are present while the athlete is still competing, can lead to compound fractures if not addressed. It is vital for all athletes to make sure that they are stressing their bones as well as their muscles during all training programs! Supplementing with Vitamin D and Calcium while training can also go along way in improving bone health to prevent these injuries.